When you sweat from anxiety it can be an experience throughout the whole-body. A single thought or certain environment triggers your nervous system, resulting in nervous sweats that can stress you out even more and you’re not even hot. It doesn’t have to be this way though. There are several techniques to stop sweating due to anxiety or nervousness. Deep breaths, drinking water and listening to soft music will calm your body down, slow your heart rate and reduce nervous sweats. Don't let perspiration get the best of you. Below we present some techniques. Take a deep breath. Hold for a few seconds and release. Repeat. Deep breathing will slow your heart rate and help stop your nervous sweats. If you concentrate on the situation this only makes you more anxious and sweaty. Calming yourself down will stop or at the very least reduce the sweating. We encourage you to try this technique. Hydration is very important for anyone whether they sweat excessively or not. A lack of water tells your body to sweat more to help cool you down. This is a natural process from our bodies. Heavy stress can also dry out your mouth, so be sure to drink enough water before a stressful or anxious situation to prevent excessive sweating and annoying dry mouth. Hot and spicy foods should definitely be a non-no, smoking or drinking lots of alcohol can cause you to sweat more than normal. Avoid these common sweat triggers before a nerve-racking situation to ward off the sweats. Certain medications and even coffee can cause you to sweat so avoid these also whenever possible. 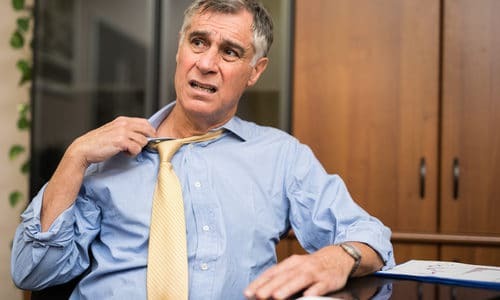 An easy way to keep nervous sweats from showing through your dress shirt is by using one of our sweatproof undershirts. Kleinert’s integrated sweat shields completely absorb sweat and allow it to evaporate, so sweat doesn’t reach your outer layer. By wearing a Kleinert’s Sweatproof Undershirt beneath your dress shirts, you'll forget you're sweating, you will stay dry and no more sweat stains visible on your shirts. A win-win in our book. Your antiperspirant can work harder by applying it before bedtime. Nighttime is actually the most effective time to apply antiperspirant because it allows the active ingredient aluminum time to block your sweat glands while you rest. Your morning shower won’t wash off the antiperspirant. Our Sweat Shield Ultra Antiperspirant Wipes are an effective solution and are waterproof thru showering and may last up to 1 week on the area applied. Always opt for natural fabrics like cotton or bamboo. High-quality cotton is more breathable and repels heat better than synthetic fabrics like polyester. Important to note that the quality of the cotton can affect the shirt’s breathability. By trying the steps above before and during stressful situations can help stop nervous sweating. Staying hydrated, deep breathing and distraction techniques will bring your body temperature down, slow your heart rate and stop anxious sweating.